During her tenure as Library Director, Louise Berry built a reputation for world-class customer service which has left an enduring legacy at Darien Library. We celebrate her legacy today. If you Googled Zingerman’s Customer Service, you’d mostly find nothing but praise, from the likes of Saveur and Forbes magazines to a plethora of unknown but passionate foodie and business bloggers. 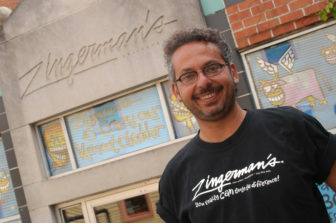 Zingerman’s opened in 1982 as a small corner delicatessen with less than 10 employees. Today it is a community of nine businesses all located in Ann Arbor, Mich., with about 700 employees and over $55 million in revenue. Through all of those transformations, they have continued to be widely recognized for treating their customers like royalty. It begs the question — how do they do it? The answer is simple (if not easy) and even better, it is entirely available to you! What makes Zingerman’s approach to giving great service unique is that they realized early in the game that in order to deliver an exceptional customer service experience day in and day out, they would need to focus on more than “just” customer service. They would need to build a culture of great service throughout their organization — top to bottom, every employee, customer facing not, every touch-point with a customer, in person, on the phone or in writing! Hear all about how focusing on the five elements of a culture of great service can transform not just your customer experience, but the overall culture of your business itself! Elnian Gilbert is a trainer & keynote speaker with Zingerman’s Training, Inc. Elnian’s 10 years of experience at Zingerman’s includes multiple businesses and positions, from her start at Zingerman’s Mail Order to logistical experience at ZingTrain. Her particular areas of expertise are Customer Service, Training, Open Book Management, and organizational change as well as vision facilitation. Elnian finds it exceptionally rewarding to figure out what a client needs, then tailor training to deliver it; helping them adapt and apply the tools and techniques used at Zingerman’s over the past 30 plus years.